Some men like to buy their wives diamond necklaces, 60 foot luxury yachts or small islands in the Carribean as tokens of their love. Mine likes to give me obscure sewing ephemera – far more interesting than necklaces etc. And so my latest gift is The Dexter. Intrigued? 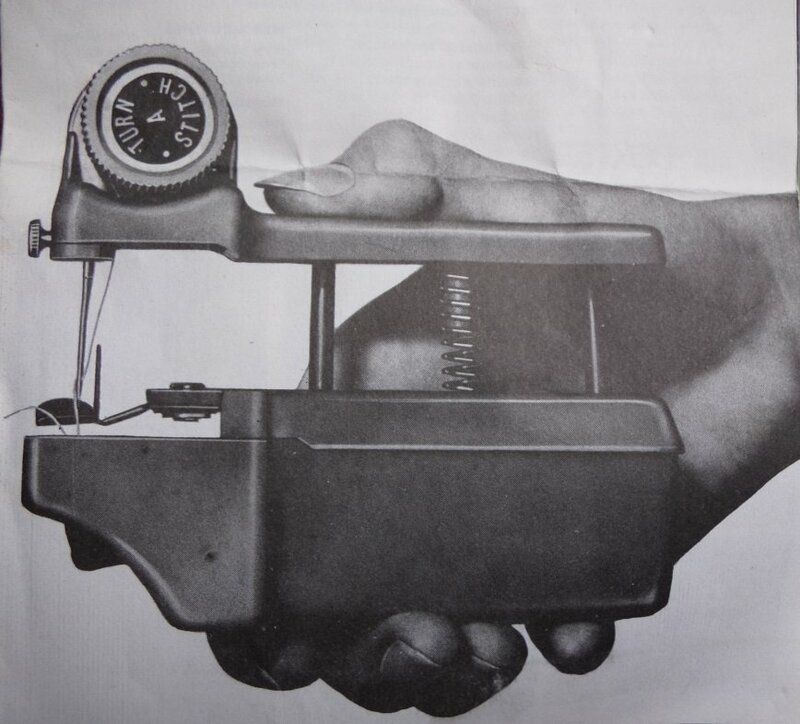 The Dexter is a hand-held sewing machine circa 1960’s. Similar machines are still available now, such as this one from Big W, or this one from Spotlight, but I’ve never tried using one. Do they really sew well enough? 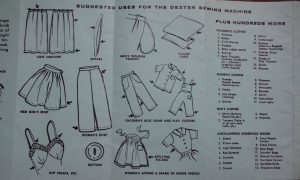 Are they worthwhile having, or would hand sewing suffice? 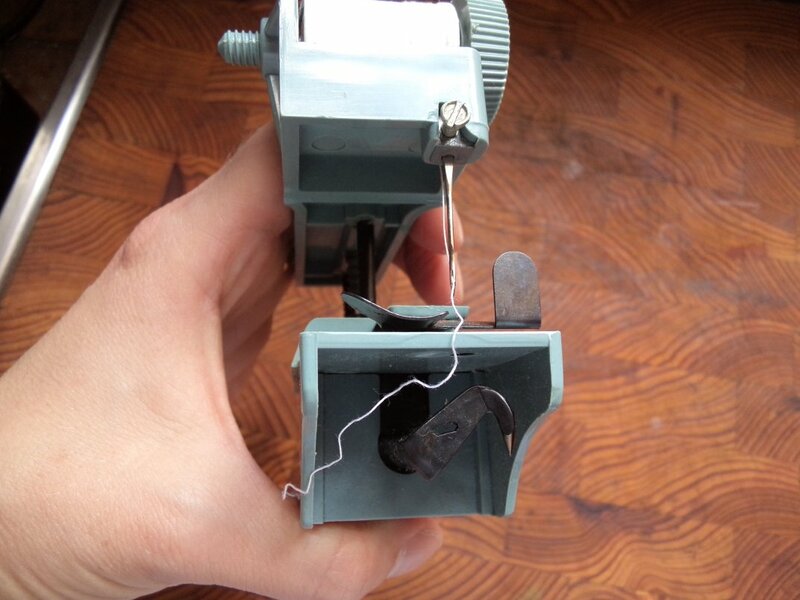 At what point should one use a regular sewing machine? Or, are these designed for someone who doesn’t own a machine? Or for travel? A glance at the brochure suggests it’s “handy for household repairs”. 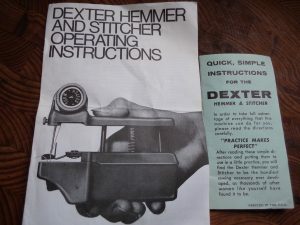 My Dexter came already threaded, with two instruction manuals. One manual is the original USA version, and another from the Australian distributor (the white one). Apparently The Dexter comes with a carry case but mine came in a plastic bag. The machine is pretty simple. You insert fabric under the foot, and squeeze the machine up and down while moving it along, holding the fabric with the left hand. However, the simplicity of the machine belies its difficulties to use. My attempts to use it were woeful. The reverse side was a mess until I remembered the tension knob. The tension is adjusted by a knob that actually tightens the thread spool. 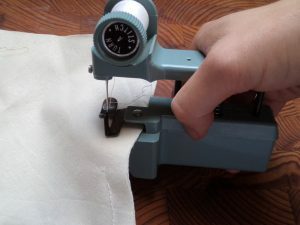 There are no feed dogs like a regular machine – the fabric feed and stitch length are regulated by moving the machine, which I found very difficult to do evenly. Part of my trouble might have been just how old it is. Even after oiling it, it’s still sticky on the up and down movement. This Youtube video shows far more experienced users than I (it’s the original commercial for The Dexter, complete with of-the-era commentary). In another video, Whitney Sews had more success with The Dexter than I did (skip through to 1.30 to see her sewing with it). They only sew as well as the operator. It takes a lot of practice. No, I don’t think they are worthwhile having. 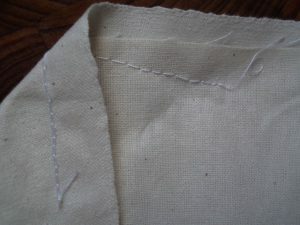 Hand sewing gives much more control and might even be quicker. I guess you could use it for basting (although, see above point on hand sewing) but it looks like they’re intended for regular seams. Use a regular sewing machine. 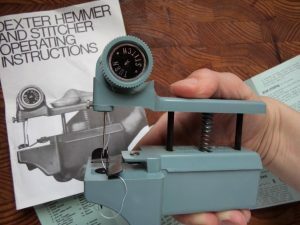 However, The Dexter makes a fun addition to a collection of old sewing items and an interesting thing to bring along to your sewing group. Have you ever used one of these? Do you own a modern one? Ever been tempted to buy one? Entertaining story – made me giggle. Now, do I keep my 1940’s Wertheim Treadle? Will I ever use it again? Probably not! Maybe Gumtree will unearth an interested sewer! Thanks for the comment Robyn. Good to know someone else has a “museum” section to their sewing gear. at a yard sale for two dollars. I enjoy doing my own sewing, ironing, decorating. My current co-conspiritor is my wonderful dog, Penny. I’ve got a sewing project for her using fake fur. It’s a coaster for a parade in October. This will be a fun experiment. My thoughts suggest I could do as well with this as with a sewing machine. although I’ve done a good amount of needlework this past sixty years. when happening upon your article. and your writing, presentation, and photos were very good examples of how to tell the story. 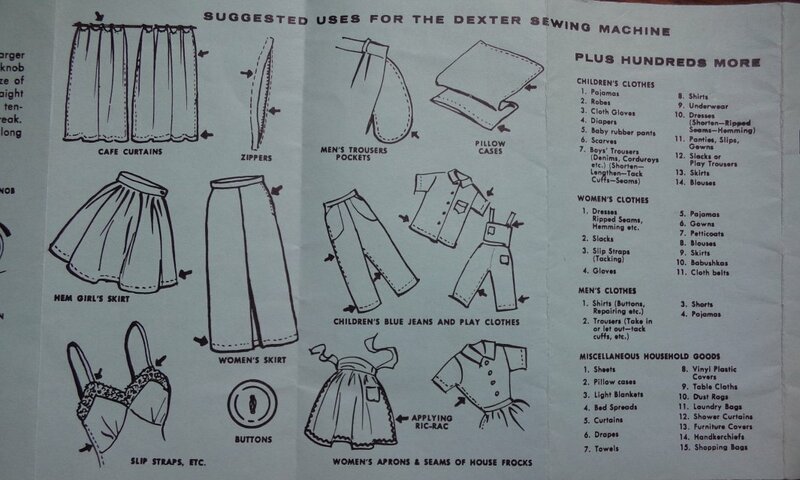 Hi Matt and Penny, I never got any further with the Dexter; found a sewing machine to be far easier! All the best with the fake fur project. 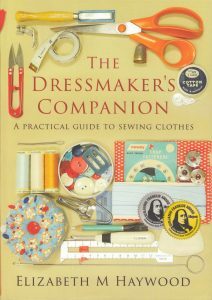 I know nothing, am blithely ignorant, unskilled in sewing, and just like to play with stuff. I claim to have failed at every job known to Humanity. a bit of esoteric knowledge was safely packed within my baggage. Pyrrhic victories are still victories. It will be my pleasure to share my Dexter-ous experiences with you. Hey, go easy on yourself, nobody was born knowing how to sew. We all started in the same place. Please do share how you get on with the Dexter.